Several posts were made in the past about this, but no thread, so I'm taking the initiative. Kentarou Miura was born on the 11th of July 1966. So today that makes him 39, I guess we can expect a mega break next year when he'll turn 40. Original picture from "Void", a Korean manhwaga. HAPPY BIRTHDAY MR. MIURA! If I knew where you lived, I'd send you a present. A moutain of presents, in fact. Of course, if people knew where you lived, you'd already be living under a mountain of presents to rival Mount Everest. I'm sure "Ken" would be glad. (too much birthday punch ) neeway.. many more happy & healthy days and years hope I for Miura San!! Happy Birthday and thank you for blessing us with Berserk! 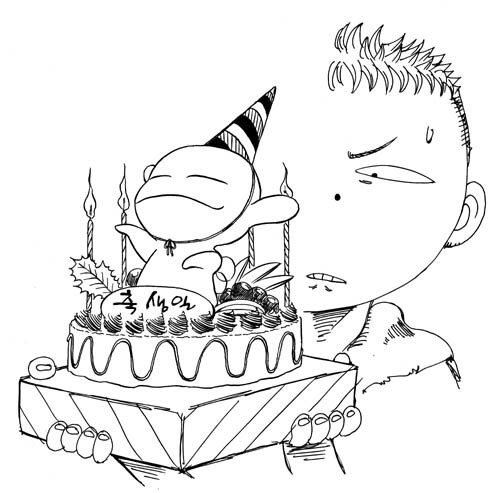 Although i'm late I'd like to wish an happy Birthday to Miura. Well, by now it's more like you're early. Still 2 weeks and a half to go before his birthday this year, he'll be 40. That's awesome, Mr. Miura's Birthday is the day after mine Should I invite him to the party? In concordance with Miura's midlife crisis, Berserk will now be featuring a more cleavage and sports cars. I wonder what he will like for his birthday? Maybe we should buy him a Dragon Slayer so he can be just like Guts. Just kidding! HAPPY BIRTHDAY MR.MIURA!!! youre my inspiration! its cool were both leo, since i cant be there drink lots of sake for the both of us!! You're two days early foo! I like your avatar by the way. Long live Wolfwood!